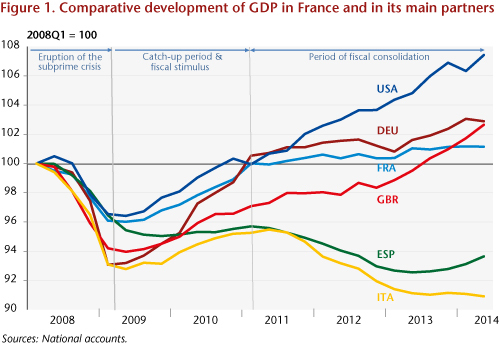 In early 2011, France was one of the few developed countries to have regained its pre-crisis level of GDP. Economic growth exceeded 2%, even reaching 3% yoy in the first quarter of 2011. Since then the situation has changed: the recovery was interrupted, and while the economy is experiencing positive growth, the rate is close to zero (Figure 1). Four types of shock explain why the post-recession recovery in 2011 died out. 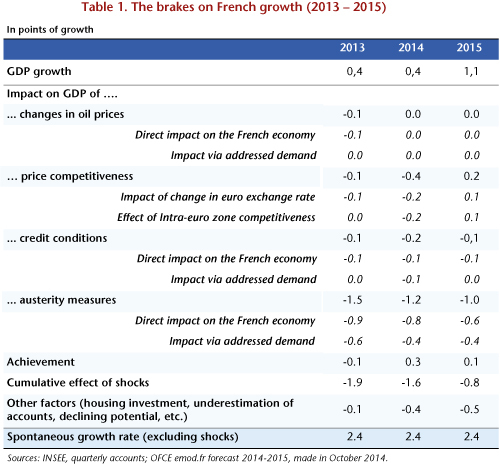 Growth was already being battered by austerity and by deteriorating credit conditions, and was then also hit by fluctuations in oil prices and by the impact of price competitiveness in 2012 as a result first of wage deflation in France’s competitors and then in 2013 of the rise of the euro (Table 1). In 2014, the improvement expected on the economic front did not occur: the stimulus due to the gradual easing of austerity is being offset by the powerful brake exerted by the significant appreciation of the euro that has taken place since mid-year as well as by the collapse in consumer investment in housing. As in the previous two years, growth is expected to come to 0.4%, which is not enough to reverse the rise in unemployment or to reduce the public deficit significantly. Worse, while the public deficit has been cut by over 3 GDP points since 2009, it is now expected to rise slightly once again, reaching 4.5% of GDP (Tables 1 and 2). In 2015, growth will pick up some, to +1.1%, due to the weakening of the negative factors that have stifled it since 2010, in particular credit conditions and austerity. Furthermore, the effect of price competitiveness, a factor that has played a very negative role in 2014, will be reversed, due first to the depreciation of the euro, and second to the rising impact of the CICE tax credit, whose primary goal is to ensure lower export prices. But with GDP growth of 1.1% next year, the path towards expansion is still a long way from what can usually be seen during a post-crisis recovery (i.e. 2.4%). As the output gap is not closing, the anticipated growth cannot be deemed a recovery. Companies will benefit from this renewed pick-up to gradually restore their financial situation. This strategy is based primarily on increasing productivity, which will help to reduce surplus capacity and restore profit margins. The unemployment rate in metropolitan France will rise slightly to 9.9% in late 2015, and to 10.3% for France as a whole. The counterpart to loosening the austerity reins is a public deficit that is higher than what was originally programmed. 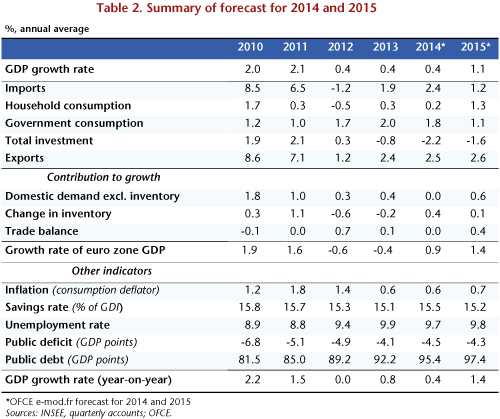 It is expected to be 4.3% of GDP in 2015, departing significantly from its path back towards 3%. In order to meet its commitments on structural efforts and nominal deficits, the government could decide to vote to make an additional effort of 8 billion euros. This would correspond to a 1.2 point hike in the standard rate of VAT. If that happens, GDP would grow no more than 0.8% next year, and the deficit would be reduced by only 0.2 GDP point, compared to our baseline scenario (Table 3).